I find it odd whenever a biopic is made about someone who is still alive. I guess I think they still have life in them, so why not wait till they’re gone? So, when I first heard that Todd Haynes was creating a film about the Bob Dylan, I was quite hesitant, despite being a Dylan fan. I wondered what angle it would take and how it would be made, not to mention whether or not it should be made. But then I heard Dylan approved the film which made me curious, I now had interest in seeing this. The film I wound up seeing last November was far removed from any biopic clichés anyone has seen. Haynes has made a film that truly embodies and envisions the various personas of one of the greatest songwriters of our time. Gone is the tortured past or drug addiction that we so often see in these films. Instead we get a unique non-linear look at the various personalities of Dylan, from the early 60’s to the early 80’s. No dates or years are listed on the screen to tell us where we’re at, therefore, we are left to discover these personas apart from any time or place, not knowing what is the truth and what is dramatic fabrication. Someone who knows next to nothing about Dylan may be entertained, but also might be totally lost watching this film. It’s sure to be one of those divisive films that some people will love the instant they see it and others will openly loathe….like Dylan himself. Six different actors play some incarnation of Dylan, corresponding with different phases of his life and career. They come and go throughout the film like the ocean’s tide. That’s unique right there and a tell-tale sign that this is far from the ordinary biopic. The best part of this diverse cast is that Haynes doesn’t have all of them going for a dead-on resemblance of Dylan, some of them look nothing like him at all. This makes it easier to focus on a particular phase of Dylan’s life through the actor’s storytelling, subtle nuances and inflections. It’s no use trying to describe these characters as they appear since they come and go at random, but I’ll try. The first “Dylan” we’re introduced to is an eleven-year-old African-American boy bound for glory. He calls himself Woody Guthrie ( Marcus Carl Franklin ), as he hops boxcars, pretending he’s the pioneering folk singer and claiming he’s going to unionize the working man. Then there’s the other extreme, an aging Billy the Kid (Richard Gere), still alive and drifting in a southern countryside amongst some circus folk (who appear to never stop celebrating Halloween) while an encroaching highway looms on the horizon. Both characters seem to be trying to preserve a time that is passing. The child is chasing a life he never lived (similar to how Dylan often idolized Guthrie’s actual life and work), while the older man is trying to maintain the freedom and solitude he created for himself (resembling Dylan’s Woodstock seclusion after a severe motorcycle accident in 1967). It’s ironic that this kid is pretending to be the older Guthrie while Gere’s older character is goes by The Kid. Clever. Sandwiched between those two extremes are four different Dylans, who follow more closely the songwriter we know. The character of Jack Rollins (Christian Bale) portrays the protest singer that introduced the world to Dylan. Bale plays him as a young idealist who dropped out of showbiz to become a preacher, disgusted at having been made a commodity. He goes into seclusion due to his unwanted popularity and eventually becomes the subject of a “Where Are They Now?” documentary, where he’s played by actor Robbie Clark (Heath Ledger). In an ironic twist, Robbie winds up taking the fame Jack Rollins rejected and ultimately pays the price as his marriage to Claire (Charlotte Gainsbourg) collapses. We see how uncomfortable this is for Robbie, as he sees what he’s become and Ledger conveys this excellently, chasing away paparazzi and closing himself off from others. Just as Bale was representing an actual time period in Dylan’s life Haynes has Ledger do so as well. Robbie is clearly based on Dylan circa 1965 and the bitter breakup to his wife Sara chronicled in the classic 1975’s classic album, Blood on the Tracks. The most talked about role in the film is that of Jude Quinn (Cate Blanchett), representing Dylan in his most recognized mid-60’s period. I would’ve never thought that someone as beautiful as Blanchett could have pulled off playing a man, not to mention Dylan (who is far from beautiful), but she does so without a flaw. Not only does she resemble Dylan the most, in this award-winning role, she also acts like him the most. At times I had to remind myself that the wild-haired, fast-talking singer who plugged in his guitar and caused a riot was not only Blanchett, but a woman. Jude cavorts around London with Allen Ginsberg (David Cross), the Beatles and ignores the Edie Sedgwick-esque Coco (Michelle Williams) in an amphetamine haze. Blanchett’s is not surprising at all to me actually. She continues to excel at each role she takes and here, as she flays about onstage like a wirey marionette singing “Maggie’s Farm” and “Ballad of a Thin Man,” I couldn’t help but think what a surreal performance I was witnessing. She sells it all so well, however, you’d never know the singing voice was provided by Steve Malkmus, the former leader of Pavement. Linking all of these “Dylans” is the character of Arthur Rimbaud (Ben Whishaw) a supposed poet, joker and thief being questioned by some kind of media tribunal. Haynes comes back to scenes with Arthur throughout the film and his insights serve as occasional transitions between the other portrayals. His commentary is the closest we get to any kind of Dylan clarification, yet even then its not entirely clear, just like Dylan. Winshaw is the vague Dylan that interviewers would eventually dread. These stories weave in and out, in intricate patterns. Some of these cuts are clean while some of the stories are jumbled. The Ledger and Bale sequences may be the most realized, but connections between Bale and Blanchett are hinted. There’s also a brief encounter between Billy the Kid and Woody as they run into each other in the older Dylan’s environment. How ironic that of all the six Dylans, it’s the two bookends that run into each other. Haynes succeeds because his approach is so similar to the actual icon. In Dylan’s nearly fifty year career he’s never been any one thing for long and that’s just what this film is as well. He films Blanchett’s scenes in black-and-white obviously inspired by the famous Dylan documentary “Don’t Look Back” and naturally sets it apart from anything else. Gere’s story is less colorful, more earthy; whereas Ledger’s segments have a crisp 70’s feel. The worlds each character inhabits all seem unique and different yet at the same time, deliberate in the color palette and tone provided by cinematographer Edward Lachman. It would be absurd to create a film that followed a linear timeline, when the man the story is about never adhered to such a limited notion. Despite all the differences with the characters, there is a commonality shared with all of them and that’s the burden of creativity. It’s easy for people to look at an artist and idolize him or her mainly because they don’t understand the artist or they don’t have any artistic talent themselves. But an artist often feels misunderstood, suffocated and plagued in the process of creating their craft. Success and fame brings further isolation, expectations can be crushing. As a public figure, Dylan has and will always change to avoid being stereotyped, to keep from being misunderstood by revealing too much. He doesn’t want to be capitalized as a brand name any more than he wants to be co-opted as a political figure. He can’t devote himself to any one woman, just as he can’t be embraced by any specific audience. He must follow his journey wherever that may take him. His muse becomes the chaos and contradictions of his own personas. 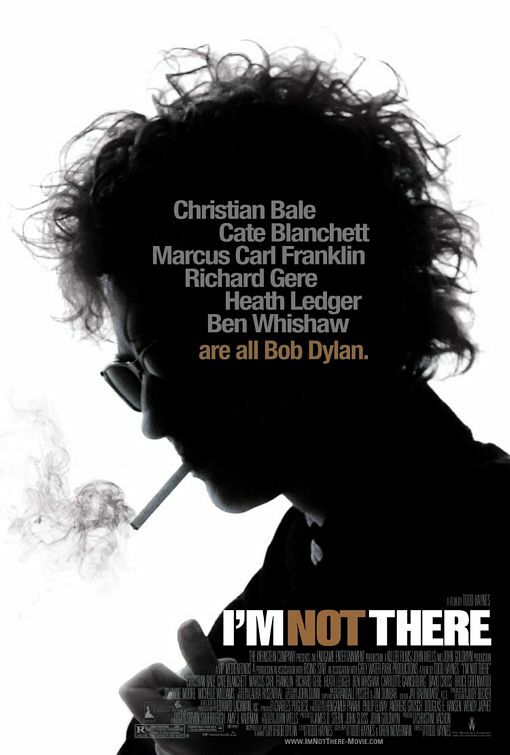 “I’m Not There” can be seen as an homage to the art films of the 60’s and a lovechild of pop and the avant-garde. It’s also a game, begging Dylan fans to connect the dots. Hayne’s exploration and experimentation here is the film’s reward. The continuous loop, in and out of time, keeps the film alive and adrift in a sea of madness. Getting to each character isn’t always easy, but when you’re on a train once thing is certain, that train will get to where it’s destined to be. When it does, it’s marvelous. There’s so much to take in here, I immediately wanted to just stay and watch it again and again, listening to the amazing music and images meld into one fantastic tribute to my favorite songwriter. Keeping It Reel CLASSICS is a feature that showcases movies that we deem as simply, classics. Old or new, they somehow resonate and stand out in our cinematic memory. We invite you to discover them yourselves, again or for the first time. Here are some others….